The 2017 AAIB Celebrity Golf Invitational was a great success! Thanks to all of our attendees and sponsors who helped make this another fabulous event. AAIB President Paul Vegliante with Michael and Leon Spinks. A wonderful time was had by all, and we were joined by the Spinks brothers, Michael and Leon, both former heavyweight champions of the world, along with other boxing greats like Iran "The Blade" Barkley, Gerry Cooney, "Poison" Junior Jones, Angel "El Diablo" Manfredy, Tracy Harris Patterson, former Miss America Suzette Charles, NY Yankee Ron Blomberg, and actor Gianni Russo. See photos from the event. 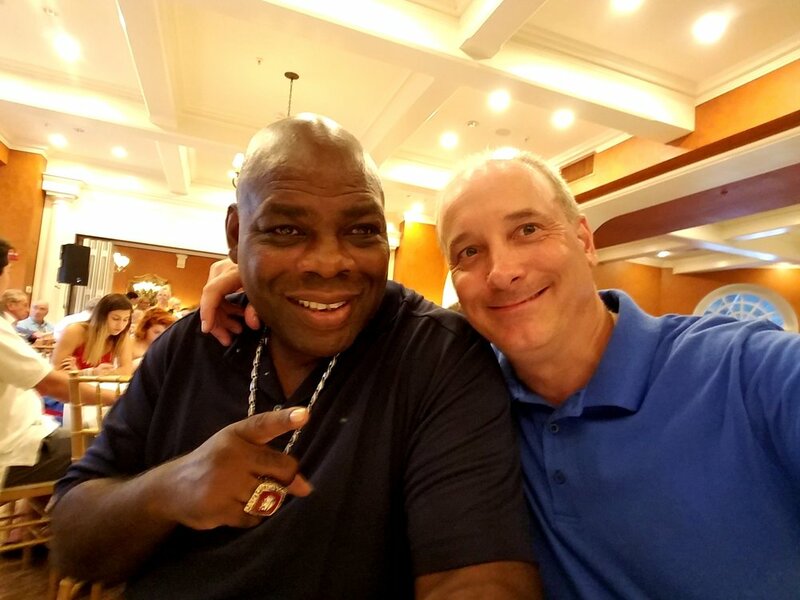 Middleweight Champ Iran Barkley and AAIB board member Charley Wood. Once again, thank you to everyone for coming out and to the beautiful Ridgewood Country Club and their staff. The AAIB is leading the way for inner city boxers to obtain continued education through its rigorous scholarship program. This golf outing is being held for the sole purpose of raising money to help young men and women stay the path and attain continued education and a brighter future. Thank you for supporting this worthwhile endeavor! Please download and return this brochure that contains all event and lodging information. Checks can be made payable to the AAIB - Boxer’s Assistance Fund which is a charitable 501-C3 entity and fully tax deductible. It is that time of year again and the AAIB is having their celebrity golf outing on July 31’st at the prestigious Ridgewood Country Club in Paramus, NJ. We are expecting an exceptional turn out and all-star class of celebrities. We sincerely hope you can join us and support this 501C3 charity scholarship program supporting inner city youth around the United States. As of last year, we have granted over $250,000 in scholarships and the applications are growing every year as word spreads nationally. This tournament plays an enormous role in these young men and women attaining higher education, so we ask for your support in July. The First Edition Is Out! The first edition of our new newsletter is out. Is it in your mailbox? If not, click over to the AAIB Connect page and sign up. Easily readable on any device, the monthly newsletter will deliver the latest information on AAIB scholars and initiatives and the world of boxing. It is brought to you by MailChimp. This premiere issue is devoted to the 2015 Fundraising Campaign for AAIB Scholars. We are exactly one month away from our campaign deadline on November 15th. Get your copy today and discover the many ways you can help us reach our goal. Do it to support #BoxingScholars. Do it to #ImproveBoxing! The 45-year-old boxing organization started by Rocky Marciano aims to double its college awards for the second year in a row with a crowdfunding campaign, new website, and online video. MOUNT VERNON, New York – Oct. 13, 2015 – The American Association for the Improvement of Boxing (AAIB) today announced its new online presence at aaib.org. The website is part of an initiative to increase awareness and funding for its successful amateur boxing scholarships. The AAIB awarded six scholarships in 2014 and fourteen scholarships this year. The organization supports amateur boxers pursuing undergraduate degrees from accredited colleges and universities with boxing programs. Typical AAIB Scholars hail from underserved populations for whom financial aid offers a transformative opportunity. The scholars regularly receive degrees in the sciences and public affairs, hoping to give back to their communities. Two of these success stories appear in the AAIB’s new online video, The Boxing Chance, featured on the website. In the documentary short, scholars Walter Sarnoi and Susan Jugo share how boxing and the AAIB gave them a chance at a better life. “The best way to elevate the sport is to support young boxers who exemplify Rocky and Steve’s ideal,” said Paul Vegliante, current AAIB President. Undefeated World Champion Rocky Marciano and Hall of Fame boxing coach Steve Acunto founded the AAIB in 1969 to promote boxing as a safe sport for the general public and on campuses. They also fought for better science and regulation in the ring. Acunto testified repeatedly before Congress towards a Federal Boxing Commission. Vegliante has refocused the organization on the nonprofit scholarship program. The AAIB held their annual celebrity fundraiser at Galloway National Golf Club in Atlantic City over Columbus Day Weekend. Vegliante hopes to match what they raise on the green with a simultaneous crowdfunding campaign on Indiegogo.com. The online fundraiser is scheduled to end on November 15th, the birthday of Mr. Acunto, who will turn 99-years-old. Indiegogo is that largest global crowdfunding site that works with nonprofit organizations. Potential donors can visit the AAIB Indiegogo campaign at http://igg.me/at/aaiboxing and follow its progress on the AAIB’s new Facebook, Twitter, and Instagram pages @aaiboxing. New and archival images for this story can be downloaded from the AAIB Flickr page at https://www.flickr.com/photos/aaiboxing/albums. For more information, or to further interview Mr. Vegliante, Mr. Hascup, or an AAIB Scholar, contact aaiboxing@gmail.com. October is family history month, when we reflect on ancestors, ghosts, and the past. American Association for the Improvement of Boxing founder Stephen B. Acunto accumulated quite the boxing archive in his decades at the top of the sport. A filmmaker from the earliest days of the AAIB, many of Steve’s boxing artifacts consist of tape and celluloid. Throughout our two-month campaign and celebration of the AAIB and Steve’s birthday, we will continue to add footage, clips, and complete documentaries to our new AAIB YouTube Channel. First up is the documentary "Boxing: More Than A Sport" on the history of boxing and the AAIB, written and narrated by former ABC Sports' producer Peter Heller. Lights! Camera! Boxing! The American Association for the Improvement of Boxing’s new online presence is just the start of its 2015 Fundraising Campaign for AAIB Scholars. We also produced a video around the theme of this year’s campaign, “The Boxing Chance.” If a fighting chance is a possibility of success through struggle, a boxing chance is the likelihood of success through strategy. By concentrating its energy on scholarships, the AAIB has reaffirmed its mission to improve the sport of boxing at the source of boxing’s future – young contenders. In this new video, filmed on location at Willis Avenue Gym in the South Bronx, young contenders and AAIB Scholars Walter Sarnoi and Susan Lizzette Jugo reflect on their unique stories and the boxing chances they were given, in their own words. The #BoxingChance video is also available for viewing on the campaign's new Indiegogo crowdfunding site and here on the home page of aaib.org. As the American Association for the Improvement of Boxing approaches a half-century of service to the sport of boxing, we invite you to follow, explore, and interact with our latest steps into the 21st century. In an effort to reach and help more boxers with more scholarships and support, the AAIB proudly announces our new website, and our new Facebook, Twitter, and Instagram accounts. The Post Game linked to a great YouTube clip of Howard Cosell with a humble Muhammad Ali discussing the what ifs surrounding the memory of the Brockton Blockbuster. Rocky would have been 92 today. "...he is forever with us in photographs at George's Cafe, in his childhood home on Dover Street, in a display downtown at Hogies Hobbies, at the Brockton Historical Society, in miniature statues gifted to Cape Verdean leaders, in the mural at Joe Angelo's Cafe, in the fists of amateur boxers and the hearts of high school athletes." The American Association for the Improvement of Boxing is pleased to announce the 2015 AAIB Scholarship winners. They are: Aadam Ali, Emily Atwood, Luis Feliciano, Pierce Hessinger, Jacqueline Ines, Susan Lizzette Jugo, Rosino LeGan, Alexandra Love, Ana Marquez, Raul Muniz, Walter Sarnoi, Andrew Tomlin, Brandon Wellman, and Kiley Wolfe. We will have more information on each of these deserving students in the weeks ahead. The AAIB more than doubled the number of its scholarships from 6 in 2014 to 14 in 2015. We received applications from 24 different states this past year. In 2016, we hope to increase the number of applicants and winners again with our new online awareness and crowdfunding campaigns. Watch this blog for more information and sign up for our newsletter. The AAIB will accept 2016 scholarship applications starting February 1st. Congratulations to all of the scholarship winners - you represent the sport of boxing at its best! The 2015 AAIB Scholarship application deadline is approaching quickly. Applications and all additional materials, including school transcripts, parental tax records, and signed permission slips must be either posted, faxed, or emailed by midnight, Saturday, August 1st. Remember, August 1st is a Saturday this year, so post offices close early. Good luck everyone! "As mentioned in the day one report, three board seats were up for re-election. That vote was held and decided today at 4:30 p.m. Incumbents David McCullough (treasurer) and Al Meier were re-elected, while Paul Artisst was unseated by Randy Neumann, in a close vote." Stephen B. Acunto's "Magical Life"
As we approach our founder’s 99th birthday, we could not be prouder of this piece on Steve’s “magical life” written by Jack Hirsh for Boxing News. From his training days, to memories of Max Schmeling, Larry Holmes, and Roy Jones, this is just like sitting with Steve and hearing his great stories in person. “Acunto beams with pride as we view the video of him and Ali gently going through the motions. Ali was in the early stages of Parkinson’s disease. He looks sluggish, but is a willing pupil as professor Acunto explains the finer points of the sweet science. No doubt he does. Thank you, Jack, and thank you for the memories , Steve! AAIB Board Member and NYAC Chairwoman Melvina Lathan has teamed up with CUNY and the Daily News Charities to provide enrollment and financial assistance to amateur and professional boxers in the city. Congratulations Melvina on creating another great resource for boxers.